. “Yeah right,” Tokyo shot back. Two upright pianos were given to me by a man who would usually have paid another man to burn them. My brief was to take a box room as a blank canvas and build into it a staircase sculpture and mezzanine level bed to sleep two using only what could be gleaned from these two ex-instruments. Dismembering them put me in mind of the French restaurant where they kill a cow on the weekend and prepare every part for food. Nose to tail carpentry. The noises that came out of the carcass – as one by one the strings were cut, as the age-jammed creaking screws were forced loose with brace and bit, as the hide-glue joins were split with a wooden club and meat cleaver – composed the most extraordinary swan song. As with good butchery, great care is taken to preserve the best cuts and though to the faint hearted observer the scene is perhaps macabre, to the butcher it is an honour to pay homage to the life that has passed in this way. Even in the dry acoustic of the studio every sound resonates through the body of the instrument creating the effect of a large stone hall. For one thing it is remarkable to discover, through the process of reverse construction, how much craft and skill goes into making even the most humble piano. The solid maple frame is fleshed out with boards of poplar or birch under a dark swirling skin of walnut or mahogany veneer. Hard, curved beach limbs form the pinblock to space the strings over the thin, flat straight-grained soundboard of Sitka spruce. Metatarsals of hornbeam connect felted hammers through an intricate arrangement of joints and pivots to long fingers of basswood coated with wafer thin slices of white bone ivory and in the gaps between these teeth, black ebony wood. Separated from the useless bulk of the junked piano and cleaned of centuries of dust the different woods begin to speak of the trees that bore them. Some parts are labelled with a name and date in the deft script of a maker. A fragment of card from a box of screws packing a joint or an old foreign coin under the keys is a seed from which flowery imagined histories grow. A faded paper pasted inside the lid notes that this piano was last tuned on March 11th 1904. Spacers in arrays of green, red and purple felt set the colours of the wood singing. The cast iron harp, the backbone of a piano, despite its delicate curves and spaces is surprisingly heavy and black. My client, a cellist with the Scottish Chamber Orchestra amongst other accolades, is very glamorous and I like to imagine that the finished staircase is somewhat in the shape of a high-healed shoe. One panel of curved wood with a dark veneer frames a mirror that reflects the staircase to form the other shoe. This inversion is itself mirrored figuratively in the symmetry of the two iron harps at right angles to each other. The vertical keys on the risers even hope to induce a feeling that one has somehow been turned through ninety degrees and is standing on a wooden wall looking down on successive keyboards that in turn pass through ninety degrees as they round the corner of the room. The weight of the pianos has become the lightness of a floating bed, their sound the flowing waveform of a banister. Thanks to Quinn, Alma and Leon for help with construction and to Su-a Lee for the conception and funding of the project. This is amazing. A very innovative way to upcycle and reimagine something that was nearly destroyed. 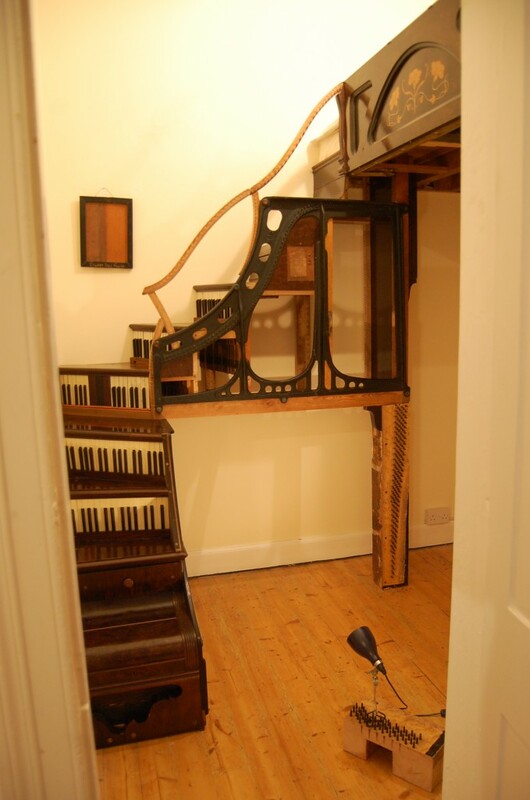 I never would have thought to take a piano and turn it into a spiral stair. Thank you for sharing your inspirational creation. Beautifully written, Tim! What a happy, loving and wonderful project! I admire the inspiration and the cataloging of the materials and craftsmanship that went into the original piano, but am I the only person who looks at this stairway and sees one giant code violation? Every single thing about this looks dangerous and ill-conceived to me. Would you mind if I linked your photo/story on my Facebook page? at home as an ‘object de art’. I have been in the piano restoration, building, restoring, playing, composing, lecturing, buying, selling, whatever for 40 years and I have to say this is the most creative thing I have seen done with two pianos. Well done! Makes me wonder what you would come up with if there were 20 pianos at your disposal. We once had 70 junk pianos and worked on building a massive sculpture at Burning Man…never happened because it would have taken three semis to get them there (another story). Your creative eye on what you did is inspiring and gifted. Too cool!